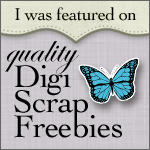 Another Freebie Round-up Digital Scrapbooking Parade, sales, freebies and games! Freebies, Prizes, Sales… Oh My! Its Digital Scrapbooking Day Christmas Dreams Digital Craft Kit and a freebie! Lovely mini kits and stamps. Thank you so much for your generosity. Thank you for this freebie. So sorry to learn about your Dad. Praying for you ( and your Mom). Thank you for the kind comment Vicki – happy crafting!